Samaritan’s Purse President Franklin Graham travelled to Ecuador today to observe firsthand the devastation caused by a 7.8-magnitude earthquake. Nearly 600 were killed by the quake and many thousands injured. The damage along the coast is extensive, and it will take years for those areas to recover.  Graham was joined by Greta Van Susteren, host of “On the Record” on the Fox News Channel, and her husband John Coale, as well as Fox News correspondent Griff Jenkins. They walked through the rubble in one of the hardest-hit areas of the country. People there remain desperate for water and food. “The people of Ecuador do need prayer. They not only need help, but they need prayer. This is a long, tough road [ahead],” Graham said. 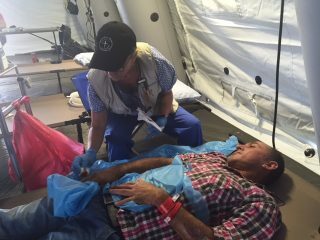 Samaritan’s Purse airlifted an emergency field hospital and 22 personnel to Ecuador on Wednesday. A second airlift today brought more materials for the hospital. A third airlift on Sunday brought resources to meet the urgent water and shelter needs for tens of thousands of suffering people in Ecuador. We are using a newly refurbished DC-8 as transport. The field hospital has an emergency room with the capacity to see more than 100 people a day; an operating theatre with the ability to perform seven to 10 surgeries daily; 20 inpatient beds; and an outpatient clinic with an adjacent lab, ultrasound imaging capabilities, and onsite pharmacy. Dozens of medical personnel will be staffing the field hospital each day. In addition to helping relieve the overwhelming medical need, Samaritan’s Purse is also at work to bring clean water to 50,000 people and to meet shelter needs for 5,000 households. Team members are assessing needs in Pedernales, northwest of Chone, and closer to the epicenter of the earthquake. Alex Saltos was riding his motorbike near Chone when the earthquake occurred. He and his vehicle cartwheeled across the road as the ground shook. The earthquake-caused accident left him with several deep cuts, bruises, and broken ribs. 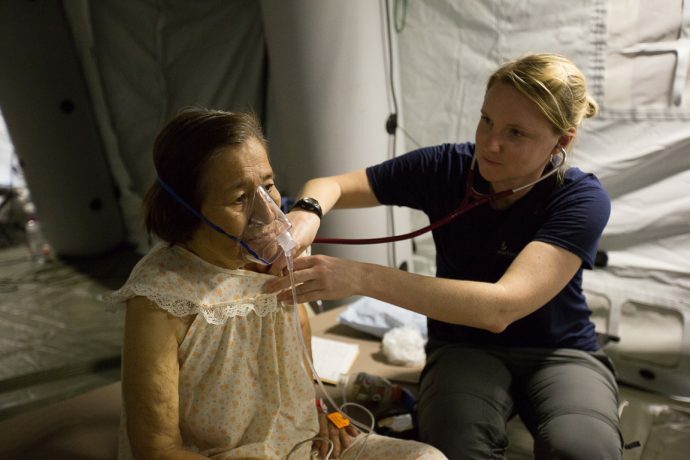 Samaritan’s Purse personnel are busy caring for patients at our emergency field hospital in Chone. A medic in the field stitched the largest cut on his arm, but Alex was still having severe pain in his abdominal region. Alex had no idea what was wrong, but he had heard about our emergency field hospital and hoped we could help. Alex Saltos is being treated by our medical staff in Chone. At the emergency field hospital, one of our physicians, Dr. Joe Lamb, diagnosed Alex with broken ribs. Dr. Lamb explained to him why he was still hurting and how he needed to properly take care of himself so that he will heal. Before Alex left, one of our nurses, Regina, cleaned his wounds and re-bandaged his arm and hand. Word is spreading that the emergency field hospital is operational, and more patients are making their way to Chone for treatment. Please pray for the hurting people of Ecuador and pray for strength for our teams as they serve them in Jesus’ Name.